The chairman of Garissa University College’s Christian Union, who survived the April 2 Al-Shabaab attack in which 148 students were killed, has pleaded for prayer for the physical and psychological healing of survivors. 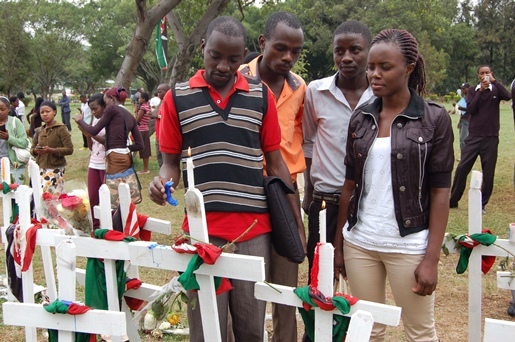 “Please pray for us… Many saw sights too horrible to describe,” said 21-year-old Frederick Gitonga. The next thing Gitonga remembers is hearing two attackers enter the room. “They sat on the beds, changed their rifle magazines and then shot at the walls to test them before going out to resume the killings. I stayed there for [a] long [time] – I do not know how long – but was eventually rescued by a Kenya Defence Force officer. “I praise God that some survived, many in truly miraculous ways. However, we are deeply traumatised, broken and in need of much prayer. At the same time we are trying to help fellow students who seek comfort and support from us. Frederick Gitonga was one of the speakers at a memorial service held at the Christ is the Answer Church in Nairobi last week. At the April 9 event, he said it will be impossible for the students to forget what happened. Bishop Mark Kariuki, leader of the Deliverance Church, echoed these sentiments. Duncan Obwamu, another student who survived the attack, explained how, between 5.00-5.30 am, a young man entered the room in which the students were praying. “He stood at the door. I could see the muzzle of his gun. I thought he was a [Kenya Defence Force] officer, who often patrol the campus. More than 80 per cent of Kenyans are Christian, although in north-eastern Kenya nearly 90 per cent are Muslim. Roman Catholics form the largest single denomination. There are also a large number of Anglicans, Methodists, Presbyterians and other denominations. Evangelical and Pentecostal churches have grown in numbers and influence, asserting their authority in the political, social and religious sectors, but Bishop Kariuki said all Kenya’s churches must learn to work together. “We are hit because, we [Christians] are not united. We need to be united and speak with one voice as churches. If we stand with one another, our voice shall be heard,” he said. 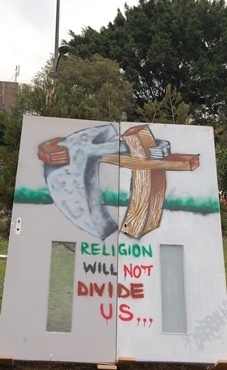 Dr. Nelson Makanda, deputy general secretary of the National Council of Churches of Kenya, said the Garissa attack was a wake-up call for Christians, who must re-examine their faith in the face of growing Islamization in the country. “We have come together because a Christian community has been butchered. They are, to us, martyrs of today. They chose to live [by] faith and died for it. Why the attackers spared Muslims and targeted innocent Christian students has fuelled further tension, with many fearing this could be the advent of a religious divide. Although faith leaders have countered this notion, they warned that Al-Shabaab is keen to drive a wedge between Christians and Muslims in Kenya. Though relations have been fractious at times, the faiths have co-existed peacefully for many years. Al-Shabaab’s low-level attacks inside Kenya have heightened since 2011, when the country sent its forces to the war-torn Somalia to pursue the group. The militants responded by targeting churches, public transport and government buildings, such as police stations. But as the Islamists escalate attacks on churches and Christians, church leaders have been growing more edgy, demanding more government action on security. 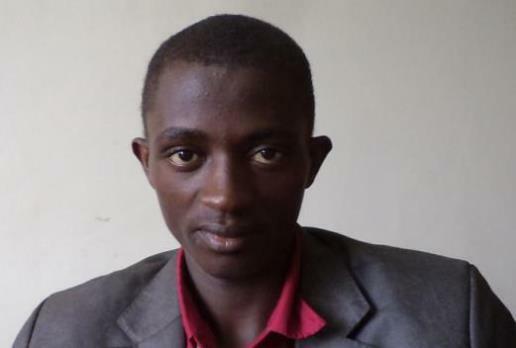 Makanda said the blood of the Christian students should be the “seed of our unity” and that Christians should continue to speak as one united force – a united Christian community. “We must begin to engage our leaders,” said Makanda, who added that Muslims should take some responsibility to be their “brother’s keeper”, protecting the property and rights of others. One male student was killed and 141 injured in a stampede on the campus of the University of Nairobi on Sunday (April 12), as students mistook several accidental explosions for an extremist attack. Mbithi said that many students were injured when “thinking it was an Al-Shabaab attack,” they jumped from the upper floors of their dormitories. Anxiety has also gripped more than 100 families unable to identify the bodies of loved ones. Some have camped at Chiromo Mortuary in Nairobi, hoping they can get some information about their relatives.